What a great way to start a weekend. Yum! This was a great dish adapted from Maggies Bites and I will definitely be making it again. If you are able to eat dairy, please see her recipe as she adds mozzarella to the dish. However, I have adapted it to make it Stephanie-friendly. This was a great, easy way to pump up the flavor profile in plain, old, chicken breasts. 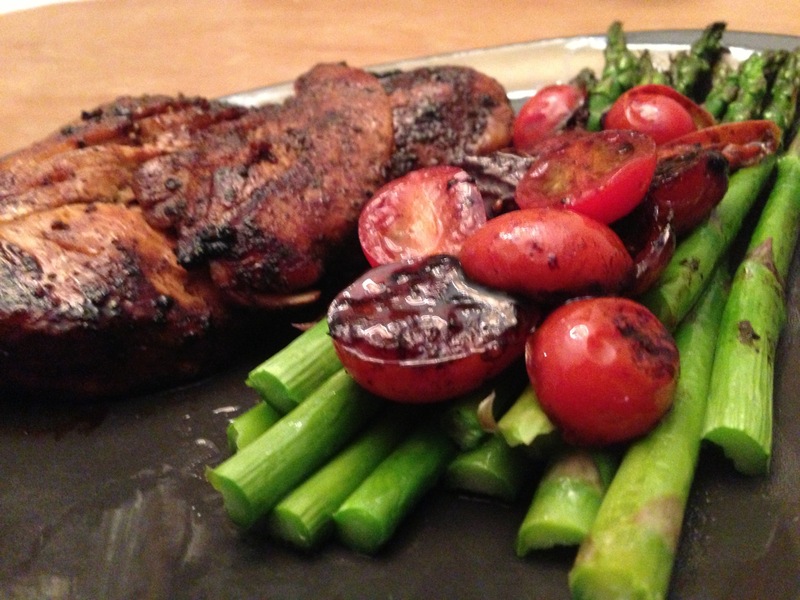 The chicken was flavorful but still moist and the asparagus and tomatoes were delicious. This also re-heated very well . . . easy to bring to work for lunch the next day! Combine 1/2 balsamic, 1/4 olive oil, garlic powder and pepper into a Ziploc bag. Add in raw chicken breasts and marinate from 30 minutes to overnight. **I marinated mine for about 4 hours and it was delicious. After marinating, pre-heat oven to 400 degrees. Bend ends of asparagus until they break. You can then choose to cut off ends to even the ends, but this is not necessary. Line cookie sheet with tin foil and place asparagus on cookie sheet in one layer. Drizzle with olive oil and sprinkle with salt and garlic powder (or minced garlic), to taste. Place on top rack of oven for 8-10 minutes until tender (until you can easily pierce with a fork). 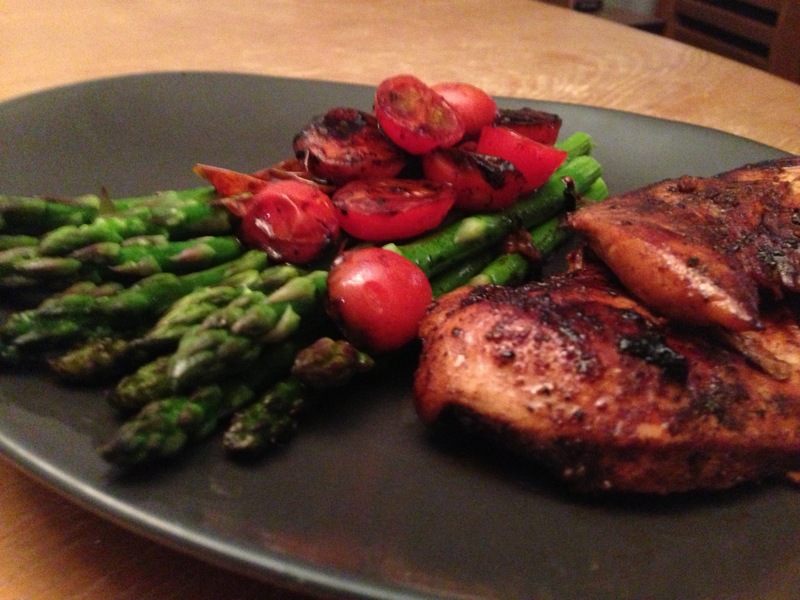 Place chicken and asparagus on a serving dish, top with tomatoes. 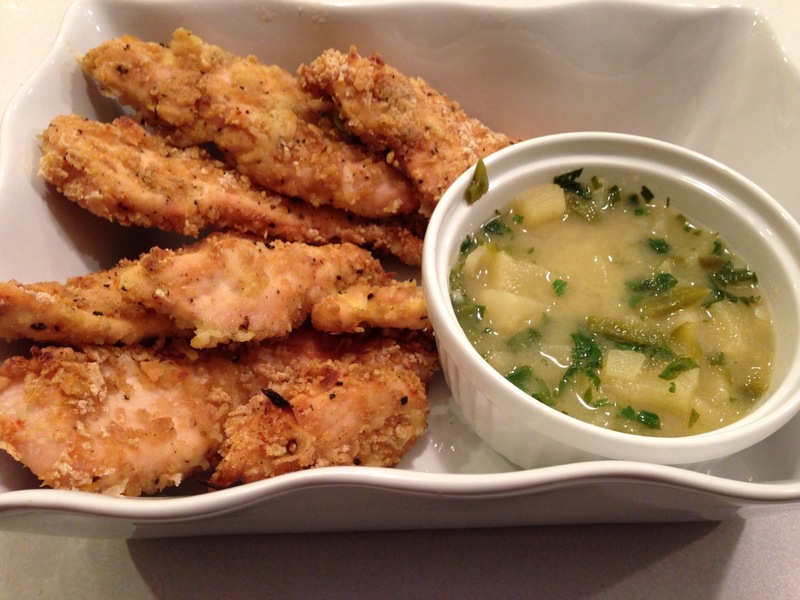 The other week, my father-in-law started a mission to make the best gluten-free/dairy-free healthy chicken strips. I wanted to try to help him on this mission so I tried a recipe from Healthful Pursuit but modified it a bit as I didn’t have all of the ingredients for the sauce and didn’t want to run to the store. Lightly beat the egg in a medium bowl, set aside. Mix the rice chex, flour, garlic powder, salt and pepper in a shallow bowl. Dip each chicken strip in the egg and then coat with the rice chex mixture. Place on the baking sheet. Repeat with all strips. Evenly drizzle all strips with olive oil on baking sheet. Bake for 15 minutes, flip strips, cook for another 10-15 minutes until cooked through. Optional: I put my strips under the broiler on low for another 5 minutes to make them a little more crisp. Add pineapple, garlic, jalapeno, broth, mustard and honey to a small saucepan. Cook on medium for about 6 minutes, stirring often. Once reduced, remove from heat and stir in cilantro. So easy! Just one dish and one hour to cook! Fix and forget, well, don’t forget it is in the oven, that would be bad. My kind of meal. Perfect for a week night when you don’t want to do a lot of cooking or clean up! 1. Preheat oven to 350 degrees F. Oil bottom of pan. 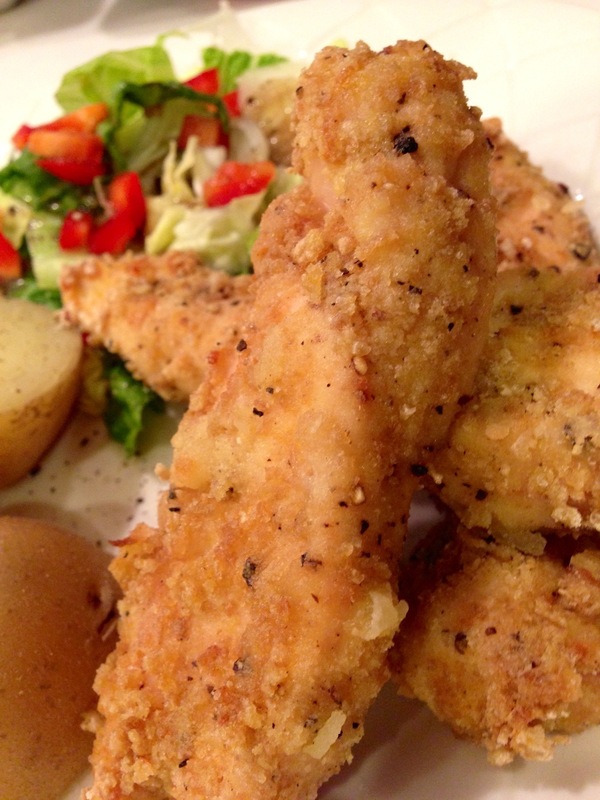 Cut chicken into strips and place in dish. 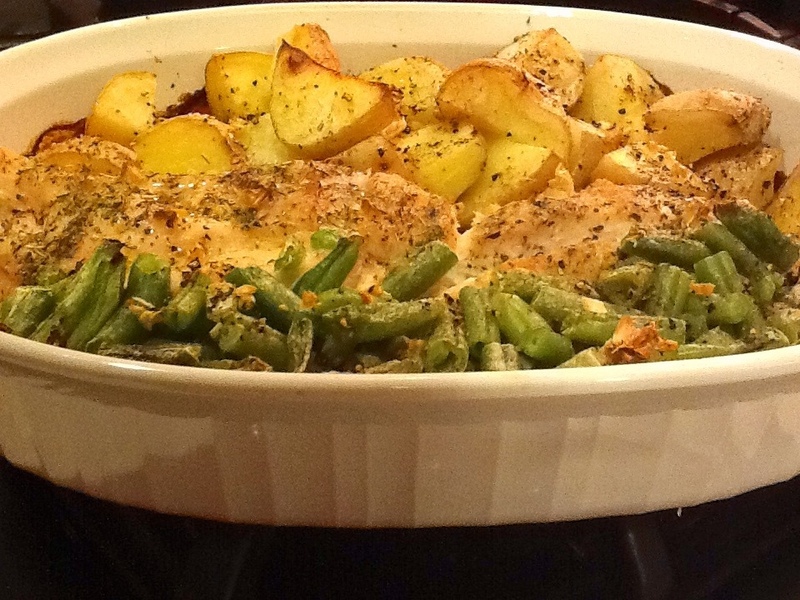 Place potatoes and green beans in pan. Add garlic and seasonings, to taste. Coat with additional olive oil. 2. Cook for 1 hour and serve. My quest to improve my diet continues with curry! I have never been a big curry fan but was willing to give it another try when I learned of its anti-inflammatory properties. 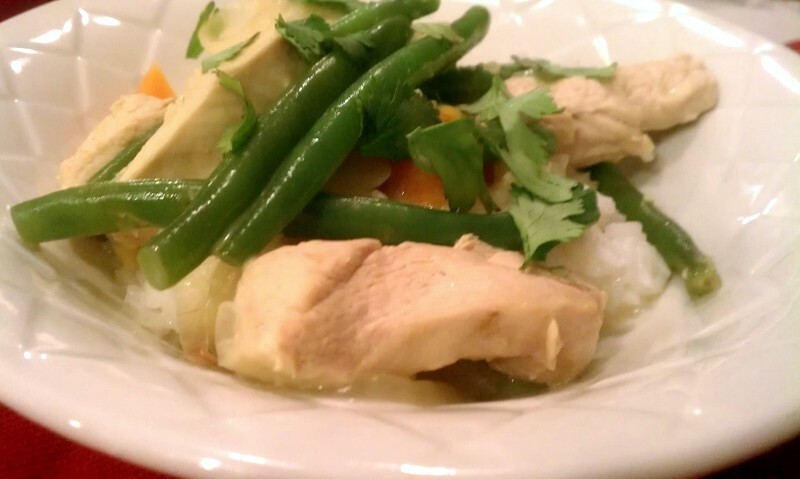 My wonderful husband had this Thai Curry Chicken dish that he wanted to try out for a while, however, I kept saying, “I don’t really like curry, I don’t think I will eat it.” So, when I said that I was willing to give curry another shot, he jumped on the opportunity and made this dish. (The recipe originated from Men’s Health magazine.) I would describe this as very filling and flavorful but not heavy. 1. In a large saucepan, heat the oil on medium, add garlic, ginger and onion and sauté until soft, about 5 minutes. Add the curry paste and cook stirring for one minute. Stir in the chicken stock and coconut milk. 2. Bring the mixture to a simmer, add the sweet potato and cook for another ten minutes. 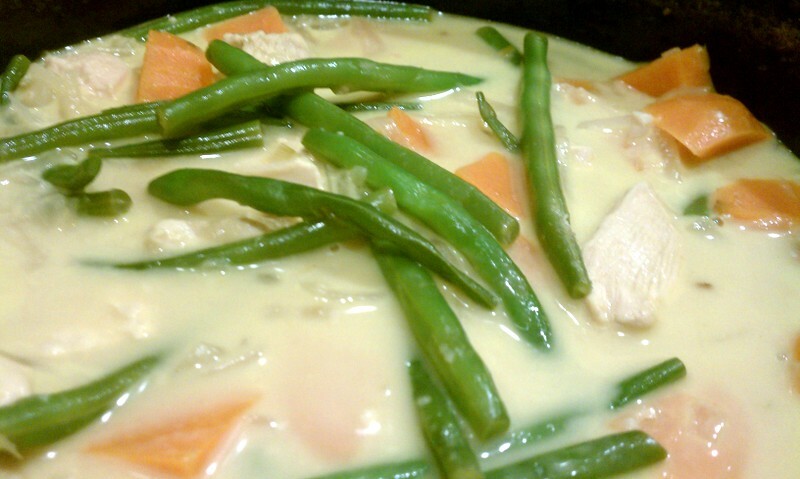 Stir in the green beans and chicken. Cook the mixture until the vegetables are tender and the chicken is cooked through, about another 5 minutes. 3. Add the juice of one lime and fish sauce. 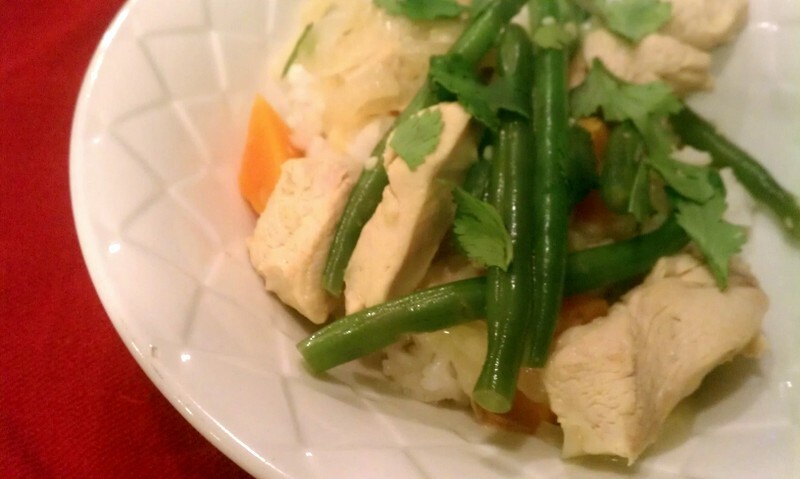 Serve the curry over steamed brown rice (or white) and garnish with cilantro or basil (optional). Every year, my husband’s family celebrates Christmas with a different theme. This year our theme was Asian Cuisine. We made Shrimp and Lobster Pad Thai, Chicken Pad Thai and Chicken Fried Rice. I was a little worried about my ability to make these dishes gluten-free as most soy sauces have gluten in them but it was no problem at all! It was so good that I have been have had a hankering for it for the past few months, so I made it again tonight. Yum! Meanwhile, in a large skillet over medium heat, cook chicken until done. Remove chicken and set aside. Heat sesame oil in a large skillet on medium-low heat. Add onion, garlic, peas, and carrots. Stir fry until tender. Crack eggs into pan and scramble, mixing throughout vegetables. Constantly mix while eggs are cooking. Add rice and chicken, combine. 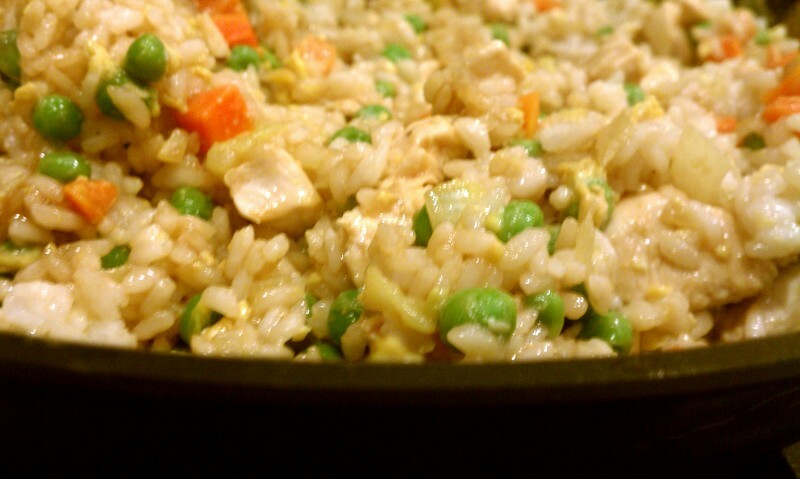 Stir in gluten-free soy sauce and remove from heat. **Tip: Many times, but not always, I am able to find gluten-free soy sauce as the cheap off-brand at the grocery store. I thought this was too good to be true so I would call customer service to check the ingredients and it was truly gluten-free. Usually saves me $2 per bottle when I can find it versus the advertised “gluten-free soy sauce”.